1.6.2017: A new COMET K2 expertise centre: symbiotic mechatronics, submitted by a team from the Linz Center of Mechatronics GmbH (LCM) and mechatronics professors from the Johannes Kepler University, led by Dipl.-Ing. Dr. Johann Hoffelner (Chief Scientific Officer, LCM), has been approved by the Austrian Research Promotion Agency (FFG) / ministry of economics and infrastructure and is initially set to run for 4 years with a total budget of around 48 million euros. The new centre will open in January 2018 and is part of the Linz Center of Mechatronics GmbH. Symbiotic mechatronics is a new concept, designed to take on the challenges of the industrial future by working together with national and international industrial and scientific partners. Hoffelner is pleased that “Months of work on an innovative, forward-thinking new concept and determining the research focal points for the new centre have finally paid off”. He goes on to explain that “Symbiotic mechatronics represents a novel paradigm for mechatronic systems, a perfect interplay between mechatronic systems, their components and their physical, digital and human environment”. The Linz Center of Mechatronics GmbH is a research and development partner of Austrian and international businesses for solutions in the field of (autonomous) systems and components, as well as the further development of production processes. As an R&D service company, LCM fills the typical gaps between science and research, thereby ensuring the transfer of research findings in industry. The basis for this is mechatronics, an advanced technology, which integrates the areas of mechanics, electronics, information technology and automation on a process, system and component level. ‘Digital Twin’. This is an international prize for leading innovations, which is awarded by the German government each year at the Hannover Fair Industry”, explains Dipl.-Ing. Gerald Schatz, Chief Executive Officer LCM. “The funding approval for the COMET K2 centre “LCM Centre for Symbiotic Mechatronics” represents a milestone for Upper Austrian research. The Linz Center of Mechatronics GmbH plays a very important role in Upper Austrian industry and has excelled in recent years through many innovative technological developments. The state of Upper Austria will contribute a total of eight million euros towards the financing of the centre over the next four years. The additional research work at the centre will help to provide a massive impetus for innovation in strategic segments and further strengthen Upper Austria as a technology base”, says Industry and Research Consultant Deputy Governor Dr. Michael Strugl in regard to the funding approval. “With the substantial company investment, the centres in the COMET programme are role models for efficient research collaboration between science and industry in terms of intensive technology transfer. From the perspective of the coordinating role of the UAR, one can see the enormous commitment of the consortium – in particular the scientific partners and the companies. 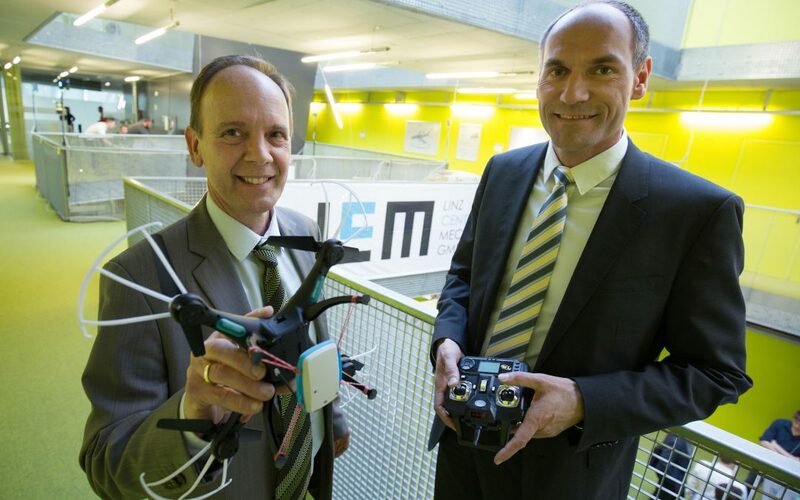 We are delighted about this huge success,” says DI Dr. Wilfried Enzenhofer, CEO of the Upper Austrian Research GmbH, which holds a stake in the Linz Center of Mechatronics GmbH. In the future, it will be possible to optimise and operate technical systems and their interaction with changing environments. This requires more efficient models and advanced numerical methods. The systems capture their environment and communicate with relevant neighbouring systems. They assess the effect of their decisions. Innovative drives then convert these virtual decisions into real processes. The aim is to improve new application options and the generation of added value in a wide range of sectors. To do so, a symbiotic approach is taken, which maximises the mutual benefits of a system, its human user and the physical and digital environment. Symbiotic mechatronics is a design approach which thinks outside the box of classic mechatronics systems and incorporates environmental factors.